for the Central Highlands and Coalfields, Maranoa and Warrego and Darling Downs and Granite Belt forecast districts. Issued at 4:02 pm EST on Tuesday 12 February 2019. A surface trough over southern and central districts will move slowly east during tonight and tomorrow. The airmass to the west of the trough is hot and dry. Locally severe fire dangers will continue over the warning area for the remainder of this afternoon, easing overnight. 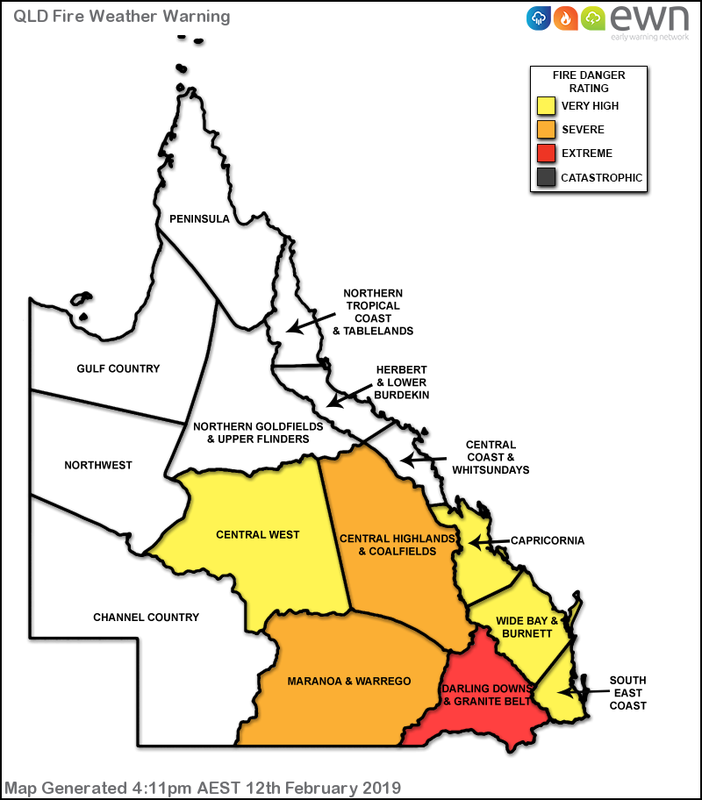 Severe and locally extreme fire dangers are forecast across forested areas of the Maranoa & Warrego, Darling Downs & Granite Belt, southeastern Central West and southwestern Central Highlands and Coalfields districts on Wednesday. The strongest winds and driest air will be on and just behind (west of) the trough in the afternoon.